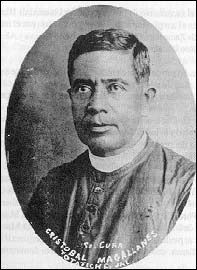 St Christopher Magallanes was born into a farming family at Totatiche, Mexico. In his youth he happily accepted the farm chores expected of him. At 19, he entered Seminary College and was ordained a Priest in 1899. He first served as Chaplain to a school and then transferred to the role of Parish Priest in his hometown. There he helped build new schools and vocational centres. In addition to his many other parish roles, he worked with local indigenous people to convert them to Christianity. When his old Seminary College was closed, on the orders of the Government, he opened a new College in his own parish. During the Cristero War, when Catholics were being persecuted by the Government, St Christopher, while travelling to say Mass in a farmhouse, was wrongly accused of being an anti-government activist. He was immediately arrested and a few days later executed, without a trial, alongside other Companions similarly accused. His last action was to give his remaining possessions to his executioners and absolve them of their sins through the Sacrament of Reconciliation. His Feast Day is the 21st May, the day of his canonisation by Pope St John Paul II in 2000. Pray for us that we will be tireless workers for the education of our children and families.